Most Mums find the festive season on its own enough to cope with. Not Natalie Allen. She opened her cafe and cupcake shop, Sweet Things, in Primrose Hill as mum to a toddler and days before having her second child. All in the run-up to Christmas in December 2011. And she hasn’t looked back since. 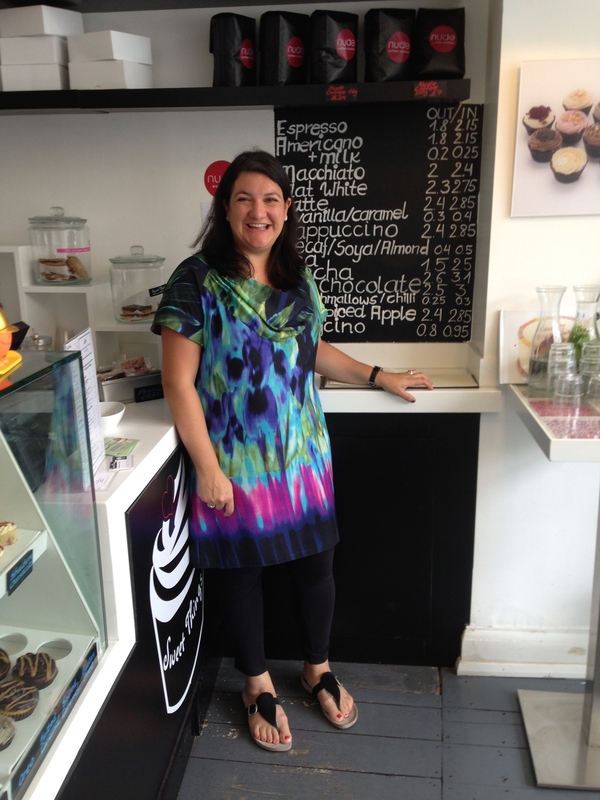 We met up over coffee in the shop and she told me all about the journey that took her from a business degree to being the Cupcake Queen of Primrose Hill. Working for a global recruitment company in the city, handling major projects, Natalie was successful but unsatisfied. “I’ve always been a foodie – I’ve always been passionate about food’, she explained. A veteran of Ready Steady Cook and Masterchef, where she was knocked out in the later stages by Thomasina Meiers, Natalie’s love for cooking was becoming more than just a hobby. Realising that of all forms of cooking, baking was what she loved best, she began by supplying David’s Deli in West Hampstead, which she continues to do to this day – although now Fortnum and Mason and Selfridges have joined David’s as Sweet Things stockists – and before setting up her current shop, she baked from a warehouse space in Primrose Hill’s Oppidans Road. Now that she has the space and the outlet she needed, Natalie has been able to develop her ideas as she had hoped. Maintaining momentum with changing and innovative flavours has been key, particularly by offering a monthly special, although vanilla, chocolate, Oreo and red velvet remain constant. Signature cupcake salted caramel has proved to be Natalie’s best seller. Much as Natalie is passionate about her sweet things, so are other people; Sweet Things has built up quite a following of dedicated cupcake-eaters. Very occasionally the disappointment of finding that a favourite flavour has been discontinued has spilled over into rare occurrences of storming-out and door-slamming; but Natalie points out that if you are hankering after a discontinued cupcake, it can be made to order. So I am relieved to report that no cupcake craving need go unsatisfied. Regent’s Park Road has proved to be the perfect situation for her shop, and she is thrilled to be a part of the village atmosphere in Primrose Hill. There were certain quirks about the area she hadn’t expected – in particular the Primrose Hill love affair with dogs. At first, she had doubts about allowing canines in to her premises, but being a quick learner, she soon had a water bowl in the corner and her own line of bone-shaped dog-biscuits behind the counter. And as she points out, Primrose Hill pooches are not just any old dogs, but are well-behaved and a credit to their humans. ‘You’re always learning in business” she explained. Isaac at work in the kitchen. Natalie Allen – does this woman ever stop smiling? Sweet Things is unique in being a wonderful welcoming, local hub for village life, all the while earning and maintaining a broader reputation for excellence with its awards and high-end stockists. With plans for extending her menu into light lunch-time savouries, and supported by a team who share her enthusiasm and perfectionism, Natalie has created something very special from her little downstairs kitchen in Primrose Hill. And with her passion for cupcakes and sweet things, that’s exactly what she does.